Like a lot of naïve people, I did not invest at all in my first five working years. Even when I did start investing, there were quite a few lessons I learned on my way. When you do start investing, one of the things you need to know about is the concept of Capital Gains Tax. However, the rules can be quite confusing and to make things simpler, here is a complete guide to Capital Gains Tax, along with examples. Any appreciation on a capital asset like equities (common or preferred stocks and mutual funds), debt (bonds and debt mutual funds) or real estate at the time of redemption or transfer, is considered as a source of your income, which then becomes liable to income tax. Capital Gains Tax can be divided into 2 parts on the basis of the holding period – Short Term Capital Gains (STCG) Tax or Long Term Capital Gains (LTCG) Tax. 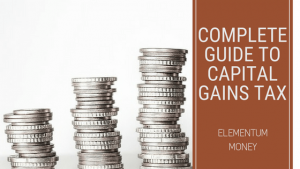 Considering the rules even for STCG and LTCG differ for each of the 3 most common categories – Equities, Debt and Real Estate, I will explain the rules with examples for each category separately. Do note that inheritance exempts you from paying tax on gains. However, if you sell the same inheritance, the gains on the same are taxed, with the date of acquisition assumed to be the same as the time when the previous generation had acquired it. For Equities, short-term is considered to be a holding period of less than a year. 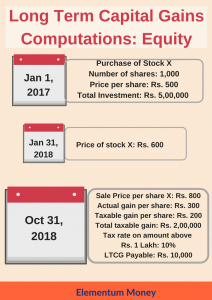 So, if you buy a stock or a mutual fund and sell it in less than 12 months, your gains attract an STCG tax on equity. The gains are considered as part of your total income and taxed as per the bracket under which you fall. Remember that you pay the income tax for the year of sale even if the acquisition was in the previous financial year. Mr. X buys shares worth Rs. 50,000 on 1st January 2018 and sells them off on 1st November 2018 for Rs. 70,000. The gains are computed as Rs. 20,000 (Rs. 70,000-Rs. 50,000) and this is added to his Total Taxable Income for the Financial Year 2018-19, even though the shares were bought in 2017-18. So, depending on his tax bracket (10%, 20% or 30%) this gain of 20,000 will attract a similar income tax. Once upon a time, not too long back, the middle class had it much easier with zero LTCG tax on equities. That means, if you sold your shares or mutual funds after holding them for over 12 months, the gains were completely tax-free. Alas, that is no longer the case. Starting this year, 2018-19, the government has now imposed LTCG tax again on equity. Even with this rule, the number of ifs and buts are a little bewildering. To put the rule in simple language: Gains through selling of equities having held them for the long-term (more than 12 months), incremental of Rs. 1,00,000 in a financial year, will attract a tax of 10%. The gains are grandfathered till Jan 31st, 2018, implying that the cost of acquisition considered will be either the actual cost of acquisition or the market price on 31st January, whichever is higher. Confused yet? No wonder taxation is so boring and incomprehensible for most people. Suppose you buy 1000 shares of Stock X on Jan 1, 2017, at Rs. 500 per share (Total investment – Rs. 5,00,000). The stock price on 31st Jan 2018 has risen to Rs. 600 per share. You decide to sell all your 1000 shares on Oct 31, 2018, seeing the stock price touch Rs. 800 per share. Debt is a broad term given to bonds as well as debt mutual funds (funds that invest in bonds). With debt, the gains attract very different taxation rules. For debt, any period of fewer than 36 months is considered to be short term. Like equities, the gain that you have through investing in bonds or debt funds for the short term is added to your total taxable income. You can refer to the equities STCG example for a better understanding as it works pretty much the same way for debt, except that the definition of short-term is far higher at 36 months instead of the 12 months for Equities. For any gains made in debt assets, having held for over 36 months, they are applicable to LTCG at a rate of 20% after accounting for indexation (as per Cost Inflation Index numbers released by the Income Tax Department). This implies that LTCG in debt products takes into account the impact of inflation and only the gains beyond inflation get taxed. For instance, you bought a debt fund worth Rs. 50,000 on Jan 1, 2010, and sell it off for Rs. 1,00,000 on Jan 1, 2018. From the table on this page (https://cadiary.org/cost-inflation-index-capital-gain/) you can see that indexation for 2010-2011 is at 148 whereas for 2017-18 the number was pegged at 272. After accounting for inflation, the tax liability gets reduced by quite a bit and it doesn’t seem that big a chunk out of the gains. Like in equities and debt, any Short-term capital gains in real estate are added to the total taxable income and taxed as per the tax bracket of the taxpayer. For a long time, the short-term period for real estate was also defined as 36 months, like it was for debt. However, in the 2017 Union Budget, this period was reduced to 2 years. If you hold a property for more than 2 years and then sell it, the gains are taken to be a part of the long-term capital gains and taxed accordingly. Like in debt, the benefit of indexation is given to the taxpayer and tax is implied only on the gains beyond the indexed cost of acquisition. However, for real estate, considering the fact that the gains can often be quite big, there is an additional clause that can help taxpayers save gains from real estate. Under Section 54, there are various ways in which the post indexation gains can be invested within the specified period. Read up more about it here. The article is slightly outdated which is why the definition of long-term is still mentioned as three years instead of the current definition of two years. Short-term capital loss comes with a provision of being set off against Long Term capital gain. So, in a particular year, if you have 20,000 short-term capital loss and 1,00,000 Long Term capital gain, you can set off the 20,000 loss to have a net gain of Rs. 80,000 Long Term Capital Gain. Thus, you end up paying tax on Rs. 80,000. In case, in a particular financial year, your Short Term Capital Loss exceeds your Long Term Capital Gain, Income Tax rules also give the taxpayers a provision to carry forward the losses and have the option of setting them off against Long Term Capital Gains for the next eight years! Read more about it right here. Income tax rules have always sounded complicated and confusing to me. However, when I took some time at it and used my head, I realized it’s not as tough as I made it out to be in my head. What’s the most incomprehensible bit about the Income Tax rules that you have faced? Let me know in the comments below so that I can try and tackle that next.